This seems to be the most pressing question among royal watchers and the short answer is no...probably. Prince Harry and Meghan Markle became the Duke and Duchess of Sussex after their wedding, but because they will not be a direct heir, they're not automatically guaranteed a title. Queen Elizabeth can make an exception and grant her great-grandchild one at the request of their parents, but given their aversion to royal protocols, it seems the couple are more likely to follow in Princess Anne's footsteps and shun titles altogether as she did for her children - Zara and Peter Phillips. If they have a boy, he can be called the Earl of Dumbarton before inheriting the title. In short, yes. The baby will be born a British citizen for obvious reasons, but if a baby is born outside the US to an American parent, the parents can seek formal citizenship for the child if the parent has been present in the country prior to the birth for at least five years. Two of those years need to be before the age of 14. It's unclear if Meghan will pursue her own dual citizenship, however, due to a number of tax implications and her senior role within the royal family. She is in the middle of the lengthy process of becoming a British citizen and is undergoing the same experience as everyone else. Who will be chosen as godparents? While godparents traditionally comprise of one male and female of the parents' choosing, royals do nothing by halves. In the case of Prince George, Louis and Princess Charlotte, each has six godparents, most of whom are close friends and family members to Prince William and Kate Middleton. In previous generations, godparents were selected to reflect the high social status and pay tribute to generations past; but the Cambridges bucked the trend by picking a number of close friends as their children's spiritual guardians. Both Harry and Kate's sister Pippa or brother James were included in the final round, despite their close relationships with all three. 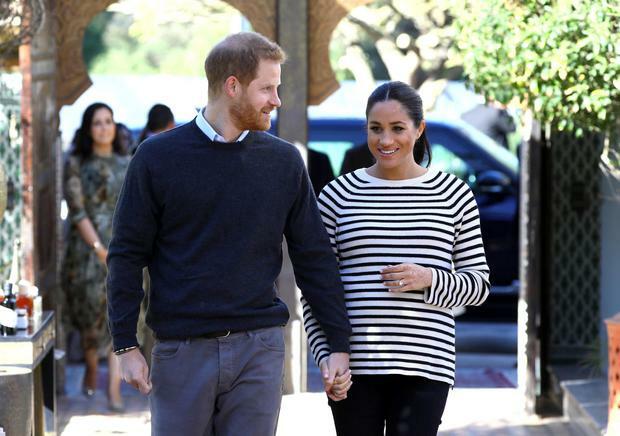 In this case, it's expected that the couple will follow suit and ask any of their close friends like Meghan's best friend Jessica Mulroney or Serena Williams, or Harry's childhood friend Charlie Van Straubenzee or cousins Eugenie and Beatrice. Where will Meghan deliver the baby? In their determination to do things their own way, and because of the hierarchy under which their baby will be born, the Sussexes have shunned the elaborate Lindo Wing 'reveal' where Kate and William have introduced their littles ones to the world. The upscale hospital in London comes to a virtual standstill as the world's press descend outside waiting to get the right shot and watch the new parents drive off into the distance, but PIppa Middleton gave birth there in relatively low-key fashion last October. Instead, they have chosen a private hospital near their new home at Frogmore Cottage in Windsor, a decision which they made in order to avoid being seen as 'copying' William and Kate, but also in a bid to avoid the immense public interest in their baby. In other European royal families, representatives will announce the birth and release a formal picture a few days later to satiate followers, a move they're expected to adopt when their own bundle arrives this month. How long will Meghan's maternity leave be? Meghan is officially on her maternity leave after making her last official appearance two weeks ago and is in the final stages of preparing for the new arrival. But the former actress is already keeping her calendar packed for six months' time, when she returns to royal duties in October. Kate gradually increased the length of her maternity leave with each child, famously heading back to full-time royal life six weeks after giving birth to George in 2013, but Meghan will attend formal events with her in-laws in a personal capacity. Will the baby really be gender neutral? No. A report earlier this year circulated that the Sussexes intended to raise their child "with a fluid approach to gender and they won’t be imposing any stereotypes", which prompted Kensington Palace to respond in a rare denial saying, "This story is totally false." This, aside from having an accurate crystal ball, is hardest to predict. Bookies are still betting on traditional royal names like Diana, Alice, Albert and Philip, but the Sussexes do things their own way and may choose a name independent of royal relationships - although chances are Diana is likely to appear somewhere as Princess Charlotte's full name is Charlotte Elizabeth Diana, in honour of William and Harry's late mother.